This will be the place to find news and notes important to members of SHoWLE such as proposed bylaw changes or other information needed for an upcoming members business meeting. We have moved to Mailchimp to send out updates. Follow the link to a browser version of the email our members and contacts received. If you are a member or know you signed up for our email updates and have not received them please let us know through our contact form. We have moved to Mailchimp to send out updates and so instead of copying the text here follow the link to a browser version of the email our members and contacts receive. We had a great time at our first summer picnic with the Great Lakes Atheists. I hope you were able to check out the pictures from the event. We will be voting on the revised Bylaws before we hold the Board of Directors election at the start of our September 8th meeting. Click the link to see the revised copy. “A Board of Directors shall conduct the business of the group between business meetings. The Board of Directors shall consist of up to seven members who must be SHoWLE voting members in good standing. The Board of Directors shall elect the officers of SHoWLE from among the Board. For this first Board election only, anyone who has expressed their interest to be a member by giving us their information will be considered “voting” members and eligible to be Board members. There is no experience needed but potential board members should want to help steer the direction of the group including programing and fundraising. Board members should be available to attend monthly Board meetings outside our regular meetings and be able to donate time and/or money to help grow the group. There will be an orientation/retreat in October to help the new Board get off to a good start. If you think you would be interested then place your name in nomination. If you can’t attend the September meeting then let Shawn or Doug know you are interested and we will add you to the ballot. We recently joined a new social media platform MeWe.com and have a group page there. If you have any comments or questions feel free to send us an email or talk to us at the next meeting or event. The Bylaws were adopted in June but when Doug went to convert the document to PDF format he found many typos and repeated section heads he missed the first time. He also decided to add some wording and change the name of the Board of Trustees to Board of Directors. We will need to hold another vote at the September meeting to adopt the corrected version. Doug apologizes for the inconvenience. In the meantime the current version is active. Our Board elections will be held right after the vote on the Bylaws at the September meeting (09/18/18). Nominations are open until then. 7 seats are open with four seats being back open at the member’s meeting in 2019 and the other 3 being open in 2020. Board terms will normally be for two years. We would also work with anyone who wanted to be a voting a member and could not afford their dues. We will start collecting dues with new members or renewals starting on October 1st. Those of you who have become members between our formation and September 30th will have voting memberships that expire in 2019. You can also renew ahead of time if you would like. Regular Meeting space – Toledo First UU Board voted to allow us to use a room at the church for our general meetings each month. We are confirmed for September 8th, October 13, November 10, and December 8th. Our cost will be $25 per meeting and Doug can cover that until donations start coming in. September meeting – Thomas Jackson has been confirmed to speak to the group about Urban farming. He had a run in with the city over his vegetable gardens and that has led to a renewed effort to be more welcoming of urban farming in Toledo. Toledo Pride booth & parade – 08/18/2018. We have a tax number so we can get the $25 non-profit rate for a booth. Still need volunteers from 12 PM to 7 PM and we would also like to march in the parade at noon. We still need volunteers for the booth – sign-up here. 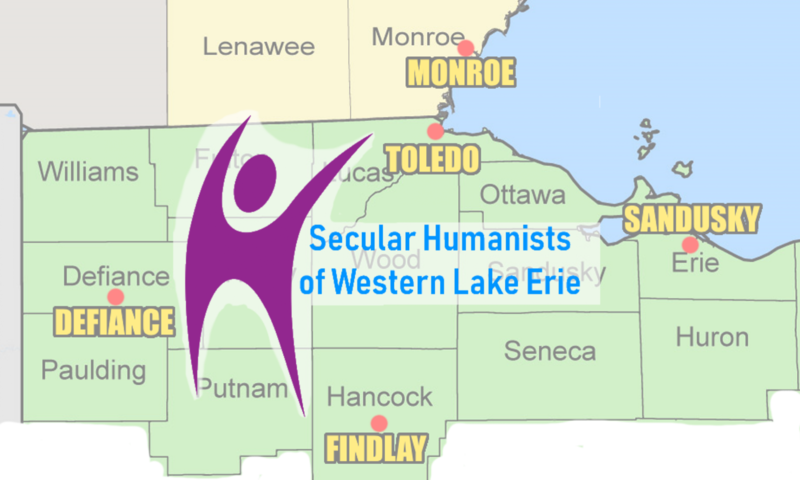 Humanist Nooners – Doug is “hosting” visits to area restaurants at noon on the third (? – the August one might be on the fourth Wednesday because the third week is so busy) Wednesday of the month starting July 18th. Joint Picnic with GLA on 8/12 – GLA will provide the charcoal and SHoWLE will provide the soda/water to drink; People bring something to grill for themselves and a dish to share. Ask for games or equipment as well. Permit is in hand. Hope it isn’t 1500 degrees that day. The committee also discussed other potential topics for future meetings. Some of them mentioned included Religion in the schools, food access, secular sobriety, and a trauma informed society. Read the full committee minutes here. We had a short business meeting before the speaker on Saturday and considered the draft of the bylaws. It was adopted by a vote of 6 to 0 with no abstentions. We will be having three standing committees (Budget, Membership, and Programing) open to all interested members of the group. It is not required to be on the Board of Trustees to be on any committee. There will be other ad hoc committees formed at other times as well. If you would be interested in serving on a committee let Doug or Shawn know. The plan is to have Board elections at the October meeting. Our Board term runs from November 1st to October of the next year. If you are interested in serving on the Board check out the bylaws and let Doug or Shawn know. You can nominate someone or yourself and nominations are open until the time of the election. More details on how the election will happen will come soon. We now have a tax ID number so we can open a bank account soon and in about six weeks by August 1st) we should be tax exempt under the exemption for the AHA. We HATE asking for money. We’ve always hated doing it. We know it is a fact of life for a non-profit that we have to beg for money. But here is what we want to do. If all the people who’ve expressed interest in the group donated $20.00 we would have $500 today. That is the cost of a good dinner or a week’s worth of fancy coffees. We don’t have a bank account setup just yet so feel free to give us your donation at the next meeting or event or if you want to do it online you can send a donation to Doug’s personal paypal account. We want to have a booth at the Toledo Pride Festival on Saturday August 18th from Noon to 7 PM. If you didn’t sign-up to volunteer for the booth at the meeting, please fill out this volunteer sheet. We can use people all day and it can even be for an hour. We would also like to march in the parade so if you are interested in that let us know. The Steering committee agreed that SHoWLE fiscal year will run from October 1st to September 30th of each year and our Board terms will run from November 1st to October 31st each year. This will help minimize issues during a Board transition and a need to pass a budget for the coming year. Board of Trustees seats open – when and if the bylaws are adopted there will be seven (7) seats open on the Board of Trustees. If you are interested in getting a seat and know you won’t be at the election meeting (most likely in September) – let Doug or Shawn know. Standing Committee Openings – with the adoption of the bylaws there will be three standing committees needing help (Budget, Membership, and Programing). It won’t be a requirement to be on the Board to be on a committee so let Doug or Shawn know if you would like to be considered for a spot. Check the bylaws draft for an idea what the committees are about.